If we want berries, we need farmworkers! Action needed today! Home | Newsletter 158: If we want berries, we need farmworkers! Action needed today! Newsletter 158: If we want berries, we need farmworkers! Action needed today! Berry season is approaching in many parts of the United States. And farmworkers who harvest berries need your support. Driscoll’s is the largest berry company in the world. They have committed to upholding freedom of association at partner farms. This commitment is not only embedded in its worker welfare standards, Driscoll’s also affirmed its commitment in a meeting with Fair World Project and farmworker leaders last year. 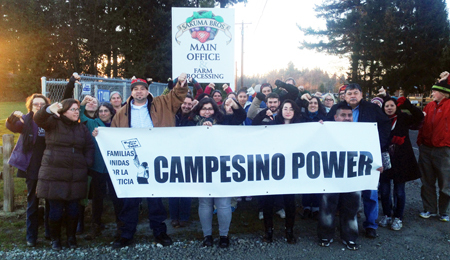 Yet farmworkers at the Sakuma Brothers Farm in Washington have formed an independent union, Familias Unidas por la Justicia (Families United for Justice) and have not been assured job security, fair wages, or decent working conditions through a fairly negotiated contract. Driscoll’s has not helped farmworkers secure a fair contract, despite repeatedly committing to uphold the right to freedom of association and collective bargaining. Instead, farmworkers have improved their own pay and conditions through a series of walkouts and law suits over the past three years. A landmark lawsuit last year won paid breaks for farmworkers not only at Sakuma Brothers Farm, but throughout the state of Washington. Walkouts have helped workers win temporary gains in pay or conditions. But now a contract is needed for workers. This will be a longer-term solution that will benefit farmworkers as well as farm owners and managers. Sign the petition now to support farmworkers at Driscoll’s partner Sakuma Brothers. Newsletter 157: Poultry processors denied bathroom breaks!